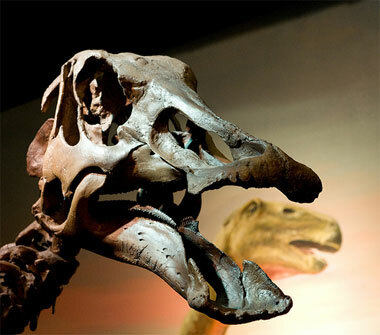 Hadrosaur fossil skull; photo by e_monk on Flickr (noncommercial use permitted with attribution / share alike). From New Jersey's official website; "In the summer of 1858, Victorian gentleman and fossil hobbyist William Parker Foulke was vacationing in Haddonfield, New Jersey, when he heard that twenty years previous, workers had found gigantic bones in a local marl pit. Foulke spent the the late summer and fall directing a crew of hired diggers shin-deep in gray slime. Eventually he found the bones of an animal larger than an elephant with structural features of both a lizard and a bird." 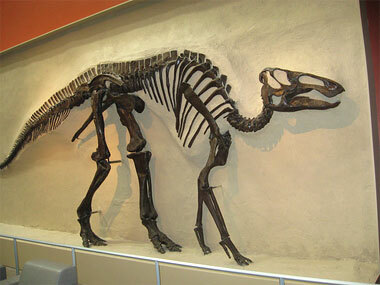 Hadrosaur fossil skeleton; photo by therealshmi on Flickr (noncommercial use permitted with attribution / share alike).